The Blades bench during a stoppage in play. 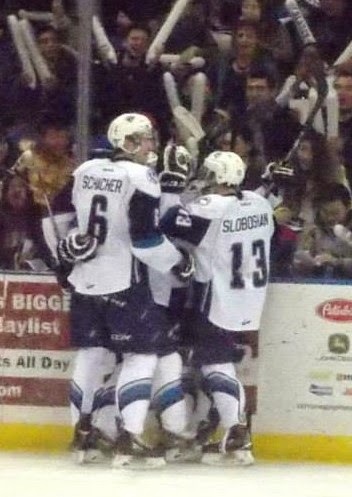 They finished last in WHL, but the 2014-15 season for the Saskatoon Blades can't be considered a write off. Still rebuilding from hosting the 2013 Memorial Cup and making a blockbuster trade to get Brayden Schenn for a run in the 2011 playoffs, the Blades were going to hard pressed to make the WHL playoffs. On ice, a modest goal would be to build on the 16-51-2-3 record the team posted in the 2013-14 campaign. They did better that mark in a modest fashion with a 19-49-2-2 finish. In the second season under the ownership of Edmonton product Mike Priestner and his management group, the team started to set more building blocks to steer the club back into the direction of being a contender and ensuring the Blades brand stays relevant in the community. The biggest sign of success came from the fact 8,929 people came to the Sasktel Centre to watch the Blades final regular season home game on March 20, which they lost 3-1 to the Medicine Hat Tigers. I know the cynics will say the only reason attendance was that high was due to the fact there was a guaranteed 50/50 pot set at $51,000, which saw spectators Ross Wiebe and Carly, his daughter, walk away with a prize of $67,207.50. Still, the fact was 8,929 came to watch a final regular season game, when the Blades had been playing out the string for about three weeks with no hope of making the playoffs. Blades centre Wyatt Sloboshan battles for a draw. As a charter member of the WHL in 1966, the Blades have seen their share of excellent seasons and really bad campaigns. In past campaigns where the final regular season home game had no meaning due to the fact the Blades would miss the post-season, it was common for about 2,300 to attend that last game. Out of the 2,300 that came, it usually felt like half the crowd didn't really want to be there. That wasn't the case with the final regular season home game for this season. All you had to do was look into the stands, and you realized the 8,929 spectators in attendance wanted to be at the Sasktel Centre that night. There was a good atmosphere in the building. Besides having a strong draw for their final regular season home game, the Blades drew 6,718 spectators to their second last regular season home date on March 14, when they dropped a 3-1 decision to the Brandon Wheat Kings, who finished first overall in the WHL. 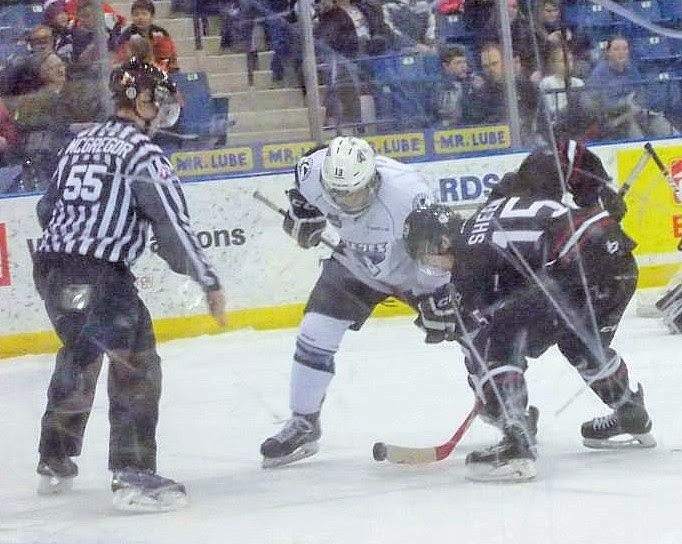 Overall, the Blades averaged 4,563 spectators for their 36 home contests, which was a slight drop in average attendance from the 4,719 spectators that came to games in the 2013-14 regular season. Those numbers are still good for two non-playoff years. The Blades management and office staff put in a lot of ground work over the course of the season to engage the community, and those efforts appear to be paying off. Over the past eight years, Saskatoon proper has seen a population increase of about 50,000, so there is also an untapped base to go after. The Blades break out of their own zone. It seemed like every game this season the Blades had some promotion going to make coming to the rink fun. One of the more enjoyable ones was likely a Las Vegas style kind of event they put on in January. Overall, it is starting to feel like the Sasktel Centre is the place to be again in Saskatoon on Blades game nights. The Blades also had a new head coach and general manager in Bob Woods this season and a new assistant coach in Dean Brockman. While the wins didn't pile up for a roster that was the youngest in the WHL, the work ethic of the players was there night in and night out. On most nights, the Blades players gave those that came out to see them perform an honest effort. They also appear to have been successful in setting up a good culture around the dressing room. While the setback stockpiled, players still wanted to be at the rink. Actually, a number of players the Blades traded away to stock up WHL Bantam Draft selections didn't actually want to leave. They wanted to stay in Saskatoon to help turn the team's fortunes around, but they also understood there is a business aspect to the league. If deals could be made to help the club in the future, they will be made. Junior hockey is the first level where players can feel the sting of the business side of the game. With that said, the Blades did their part to lessen the sting of that business blow. The Blades celebrate a goal. That was shown on the night 18-year-old defenceman and local product Nelson Nogier made his return to the Bridge City. Nogier spent two-and-a-half seasons with the Blades, and he was the poster boy team player, who was huge in representing the club in the community. He was also the WHL's scholastic player of the year in 2013-14. He was dealt to the Rebels just before the Christmas break in a blockbuster trade. When he made his return to play in the Sasktel Centre on Feb. 18, the Blades honoured him in a pre-game ceremony. He was presented his old game jersey in a glass case, an amazing looking framed action photo, and he took the ceremonial faceoff. The ceremony sent a message to any player looking to join the Blades that they will always be respected, if they come in and give an honest effort. It makes players want to play for the Blades, and it makes parents hope their kids get to go play for the Blades. On the ice, the Blades appear to have some pieces of the puzzle in place. Netminders Nik Amundrud and Brock Hamm look like they could be a solid tandem, when they return as 18-year-old sophomores. Veteran defenceman Brycen Martin, who was picked up in trade with the Swift Current Broncos, is a solid part on the back end, and he has the ability to quarterback the power play. Yorkton product Jake Kustra played seven games as a 15-year-old call up, and he appears able to provide a spark. Up front, 17-year-old rookie Wyatt Sloboshan potted 10 goals and 21 assists in 49 regular season game for his hometown WHL club. He has some sound potential heading into his 18-year-old campaign. Left-winger Nick Zajac is heading into his overage campaign and should provide some good leadership next season showing young players the ins and outs of the league. With all that said, the Blades were still last in the entire 22-team WHL. They scored the third fewest goals at 195, gave up the most goals against at 309 and finished with nine straight losses. The returning players have to work on their games and get stronger and faster physically. Woods also has to keep finding ways to keep improving the overall talent level. The Blades still have a lot more work to do in order to become an elite WHL club. If they keep following the current rebuilding blueprint they have drawn up, they should get rewarded in the long run. The Saskatoon Stars celebrate winning the SFMAAAHL title. The Saskatoon Stars didn't have to rely on their superstars to lock up their first Saskatchewan Female Midget AAA Hockey League championship. On Wednesday at the Agriplace Arena, the Stars scored twice in a span of 14 seconds and downed the Prince Albert A & W Bears 2-0 in Game 3 of the SFMAAAHL championship series. Saskatoon swept Prince Albert in the best-of-five set 3-0 to claim the Fedoruk Cup. In the championship clinching contest Saskatoon's top line of Nara Elia, Sophia Shirley and Julia Rongve were held off the scoreboard. Elia and Shirley finished first and second respectively in the SFMAAAHL regular season scoring race. Saskatoon's supporting cast came through. First, Kianna Dietz set up Jordyn Gerlitz to put the hosts up 1-0. Dietz then scored herself to put the Stars up 2-0 with Anna Leschyshyn collecting an assist on the play. Emma Johnson slammed down the door for the whole contest making 24 saves to pick up the shutout win for the Stars. Jessica Vance, who is the SFMAAAHL's all-time career leader in goaltending victories, turned away 20 shots in the Prince Albert goal. The Saskatoon Stars pose for the traditional championship team picture. The Stars also improve to 40-3 overall counting action in the regular season, post-season and their championship win at the prestigious Mac's tournament in Calgary. In the SFMAAAHL championship series, the Stars took the series opener 3-2 in overtime on home ice in Saskatoon on Saturday and claimed Game 2 in Prince Albert on Sunday 3-0. Saskatoon had made three previous visits to the SFMAAAHL title series falling in 2010, 2011 and 2012. With the SFMAAAHL championship win, the Stars advance to play in the Esso Cup female midget AAA national championship tournament which runs from April 19-25 in Red Deer, Alta. If you have any comments about this blog, feel free to email comments to stankssports@gmail.com. Check out the Twitter handle @stankssports to see more photos of the Stars Game 3 win over the Bears. The Tigers raise a banner to salute the fans at The Arena. MEDICINE HAT - Seeing The Arena empty is enough to make you feel happy. Walking into the only home rink the WHL's Medicine Hat Tigers have known for 45 years makes the mind go on a nostalgia trip for anyone that has spent time in the grand old barn. You look up into the rafters and you see all those championship banners. You look down upon the ice and into the stands any they only appear vacant for a short time. Quickly, the memory goes to work and the stands appear full of cheering fans. Willie Desjardins is behind the Medicine Hat bench swaying from side to side guiding the club as head coach. The Tigers are on the ice too. Brennan Bosch is once again scoring his double overtime goal to win Game 7 of the 2007 WHL Championship series. Rocky Thompson is out there winning a fight. Trevor Linden is no longer a 44-year-old man but a youthful forward aged 17 or 18. He is laying out crowd pleasing hits and wheeling coast to coast to score big goals. Kelly Hrudey is there too making big saves in that molded fibreglass mask that has a tiger face painted on it. Lanny McDonald and Tom Lysiak are again a magical dynamic duo leading the team to a league championship. In a more recent time, Curtis Valk is potting his 100th career regular season goal, and Trevor Cox is diving into the net to save the souvenir for his linemate and friend. No one has passed on. Those images are not ghosts, but they are still there. They still seem real, and those moments somehow and someway are still playing themselves out. On Saturday, the Tigers lived out one of the final chapters during their time in the building that sits on Ash Avenue S.E. along the banks of the South Saskatchewan River. They were playing their final regular season game against the Saskatoon Blades, who are a charter member of the WHL. 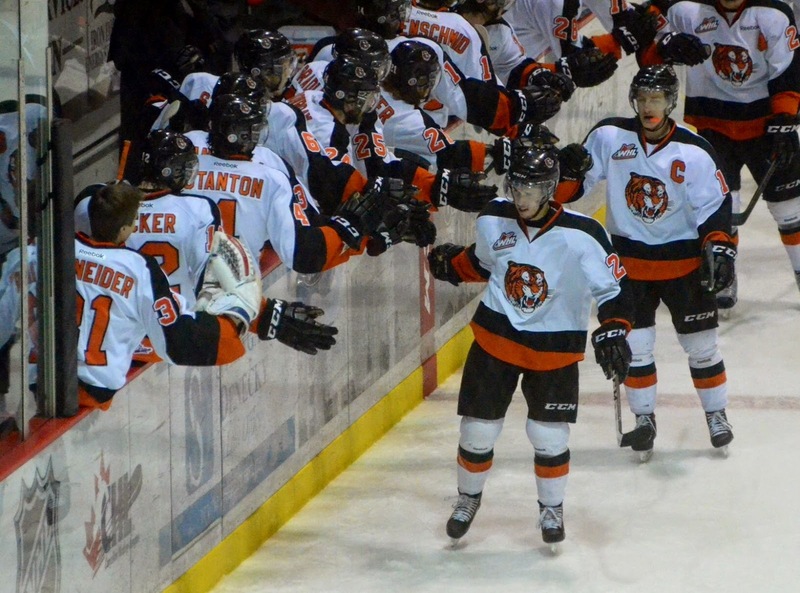 The Tigers will play in the new Medicine Hat Regional Event Centre next season. Trevor Cox follows through with a shot on goal for the Tigers. About 66 players were back in person from those old Tigers days, along with various former staffers, rink attendants, supporters and long-time fans on a night that just seemed perfect. Looking into the stands and despite the passage of time, there was a feeling things stayed the same. The fans were there cheering their hearts out like they always have. What is even better is the fact that in this rink you know them. In one corner is Medicine Hat's "Mr. Baseball" Lovell McDonnell. He has been a season ticket holder for what seems like forever. You can picture him walking over from neighbouring Athletic Park after doing some administration functions to watch the Tigers game with his grown up son Rob, who is a teacher and baseball coach in the Gas City. In the other corner of the rink is Sandy Morrice. He has volunteered his time at what seems like every sporting function in the Hat, and he has been a fixture at most Tigers games. Sporting goods store owner Hal Benson is there too visiting as usual along the walkway on the north side of the building that runs parallel to the South Saskatchewan River. You can go on and on naming and picking individuals in the crowd. They were all there in the past, and they were all there again on Saturday night. Tigers captain Tyler Lewington celebrates a goal with Marek Langhamer. For the former players that returned, that made the gathering that much more special and so unique. At times, it would take 15 to 20 minutes to walk from one end of the building to the other. The trip was filled with handshakes, hugs and conversations that recalled the old days. Those interactions seemed endless, and at the same time, you didn't want them to end. You could run into someone you hadn't seen for 10, 20, 30 or 40 years, but it seems like it was yesterday you saw them. For the former players, they wanted to see everyone. Those spectators in the stands were your former billets, teachers or buddies you hung out with away from the game. They all helped add to your life, and in reality, they are like a big extended family. Some brought old priceless mementoes in person or showed them on social media. One of those was a picture of late Tigers enforcer Derek Boogaard, who was carrying a young boy at a skate with the Tigers event. You almost couldn't believe that such a picture still existed somewhere. You could feel the love and the warm feelings in the air. Brennan Bosch gives a stirring speech at The Arena. On the ice, the current Tigers were doing their part to ensure the night's festivities were complete. They rolled out to an early 3-0 lead and held a 6-0 edge after 40 minutes of play. It was a script that played out in some form many times before for a franchise that has won five league titles and two Memorial Cup championships. The team's coaches did their part and call off the dogs a bit. Backup goaltender Nick Schneider came in to relieve starter Marek Langhamer for the final 20 minutes. The third and fourth lines played most of the final 10 minutes. It felt like the visiting Blades didn't stand a chance in stopping the host Tigers from posting a 6-2 victory. When the final buzzer sounded, Bob Ridley stepped out of the broadcast both after calling his 3,617th game as the Tigers play-by-play voice to be the master of ceremonies for a post-game celebration to commemorate the place. No one from the sellout crowd of 4,006 spectators left the building. The old players were brought out one-by-one to grace the ice surface one again to cheers. Bosch gave a stirring speech on behalf of the alumni. Video messages were shown from former Tigers players, who are active in the professional ranks, expressing how much they appreciated their time playing at The Arena for the orange and black. A written message was red from Lysiak mirroring those same sentiments. The fans at The Arena cheer on the Tigers. A video highlight reel was played showing the great moments that have been lived in the rink over the years. A banner thanking the fans was raised to the rafters and a big team picture was taken with all generations of Tigers players past and present on the ice. The night was better than anyone could imagine, and it won't be forgotten. Anyone that was at The Arena on Saturday night will now see those images when they walk into the hallowed old barn, especially when it is empty. Like all the great moments in the history of The Arena, the events from the final regular season game on Saturday night will keep repeating themselves in some way inside that building's walls without end. The memories will live on forever. If you have any comments about this blog, feel free to email them to stankssports@gmail.com. Check out the Twitter handle @stankssports to see more photos from the Tigers final regular season game at The Arena. 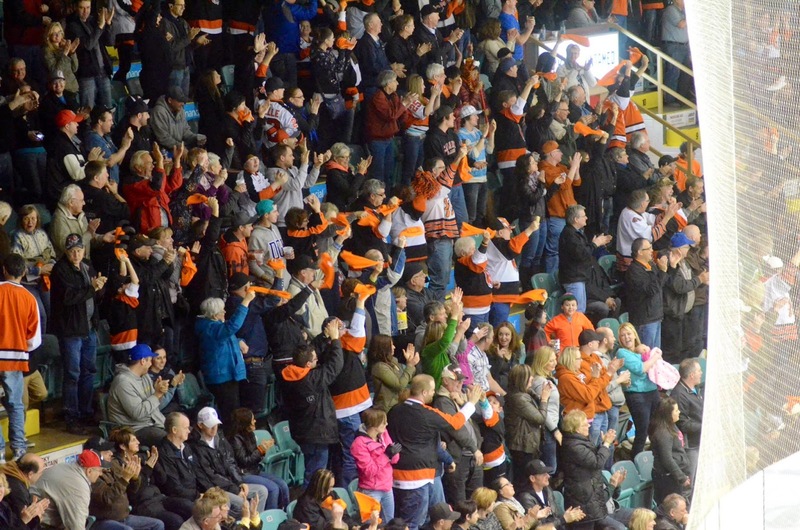 Medicine Hat Tigers fans celebrate a goal in last year's WHL playoffs at The Arena. At age 37, The Arena experienced its prime moment. Anyone that is a fan of the Medicine Hat Tigers can still see Brennan Bosch's overtime goal. On May 14, 2007, the Tigers were battling the Vancouver Giants in Game 7 of the Western Hockey League championship series, and the teams were locked in a 2-2 tie in double overtime. Both clubs were going to the Memorial Cup tournament, because Vancouver was the host team. Even with that in mind, the Tigers and Giants became fierce rivals over that championship series, not giving and inch and playing like everything was on the line. If you were at the Tigers legendary home rink that night, you can still see the game's deciding play. Rroary, the Tigers mascot, gets the fans going at The Arena. The Martensville, Sask., product skated two to three strides past the Vancouver blue-line and wired home the winner low stick side on Giants goaltender Tyson Sexsmith. The sellout crowd of 4,006 spectators at The Arena exploded like never before with the home side pulling out a 3-2 win and capturing a WHL title. In that one moment, you experienced everything that made The Arena special. A storied junior hockey team was winning a league championship in a classic junior hockey rink that had character. The victory came in a city of about 60,000 people that felt special to be a junior hockey town. As the Tigers celebrated on the ice, they looked into the stands and saw family members, fans they knew, rink attendants and the team's legendary play-by-play voice Bob Ridley up in the broadcast booth. They occupied the same spots game in and game out. Goaltender and local product Matt Keetley was answering questions during a post-game interview on the ice, and out of nowhere, he pointed to the stands and yelled out in joy that he saw his whole family. It wouldn't be that much of an exaggeration to say everyone that was partial to the Tigers cause felt like family for that one night. In major junior hockey, the Tigers are a legendary team. They have built a huge staple of memories in their storied home rink. Most can be recalled by Ridley, who has called but one of the team's games as the play-by-play voice. For the players, coaches and staff that have passed though the Tigers since they were born in 1970, The Arena is a second home. In the 1970s, they used to shoehorn the fans into the barn that contained the "Smartie Box" coloured seats. Stories were often told that fans stood five deep in the walkway that circled the top of the stands to watch games. They saw Lanny McDonald and Tom Lysiak lead the Tigers to their first league title in 1973. They also got to see tough as nails characters like defenceman and later 1987 Memorial Cup winning head coach Bryan Maxwell, who always seemed to crack the right joke. Barry Melrose, who was sporting his mullet style haircut, made his first claim to fame at The Arena guiding the Tigers as head coach to a second straight Memorial Cup win in 1988. A young fan cheers on the Tigers at The Arena. It was a building a Gas City youngster named Trevor Linden dreamed of playing in, when he attended games as a boy. He more than made good on that dream helping the Tigers win their back-to-back Memorial Cup titles. The trip to the 1987 title included a Game 7 WHL championship victory over the Portland Winterhawks, which saw fans jumping over the glass to celebrate with the team on the ice. It was a place Jason Chimera cried his eyes out over, because he didn't want to leave after being traded in the late 1990s. The Arena was where head coach Willie Desjardins brought the Tigers into their current era of success. When the team was at one of its darkest points having missed the playoffs for five consecutive seasons, Desjardins was the one that preached hockey was one of the best games there is and the rink is one of the best places to beat. He was the man that talked heart and soul character guys like Steve Marr into staying with the game, when there was every reason to walk away. 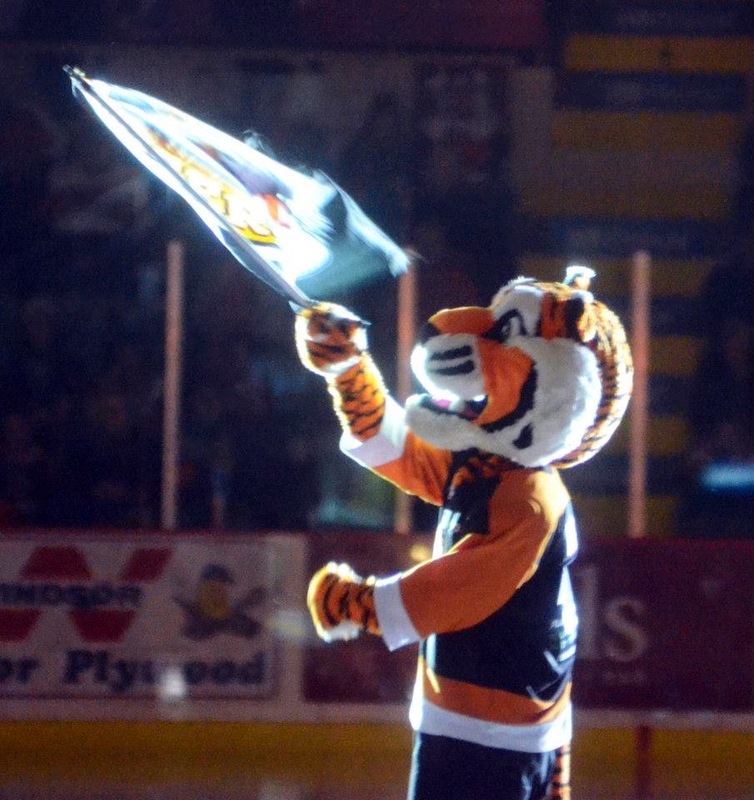 Following his first season in 2002-03, the Tigers ended the playoff drought and fell in the second round to the powerhouse Red Deer Rebels in a tough seven-game series. A year later, they won the franchise's fourth league title making that run in what was then known as the loudest barn in the WHL. Countless NHL players have graced The Arena ice wearing orange and black. A way larger majority the hit the ice arriving as boys and departing as quality young men. The Arena was the place they grew up in. It seems everywhere you walk in the building you will encounter a part of its history. Or, if you just want to have a friendly visit with someone, Tigers assistant trainer Ken Stickel, who is a fixture there, always loves to chat. Cole Sanford and the Tigers celebrate a goal at The Arena. However, The Arena's time as the home of the Tigers is coming to a close after 45 seasons. Tonight, the Tigers will play their final regular season game in their long-time home against the Saskatoon Blades at 7:30 p.m. local time. 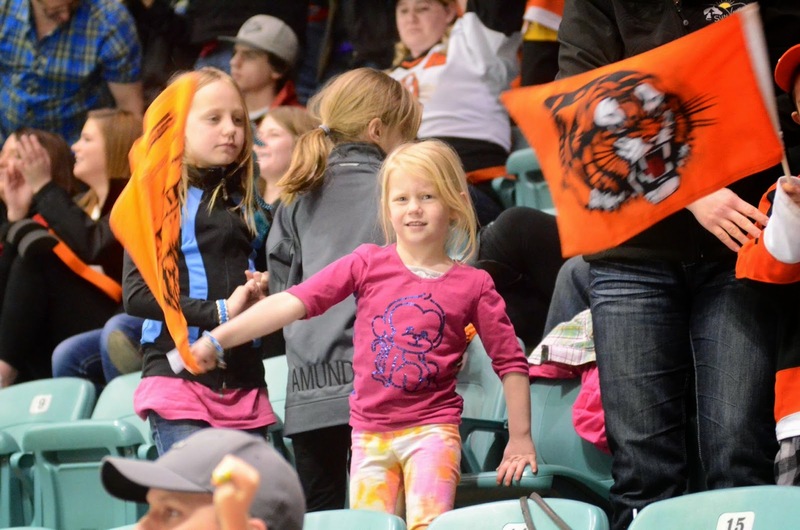 Next season, the Tigers will call the brand new Medicine Hat Regional Event Centre home. Before they make their move into their new home, the Tigers will embark on one more playoff run playing out of The Arena. The Brandon Wheat Kings and the Kelowna Rockets are the favourites to win the WHL crown, but the Tigers are in the mix. If fate would have it, it would almost be fitting if the Tigers could give The Arena one more Ray Lewis type last ride. Being the home of one more WHL championship and Memorial Cup winning team would create a fairy tale ending for the building that sits on Ash Avenue S.E. along the banks of the South Saskatchewan River. 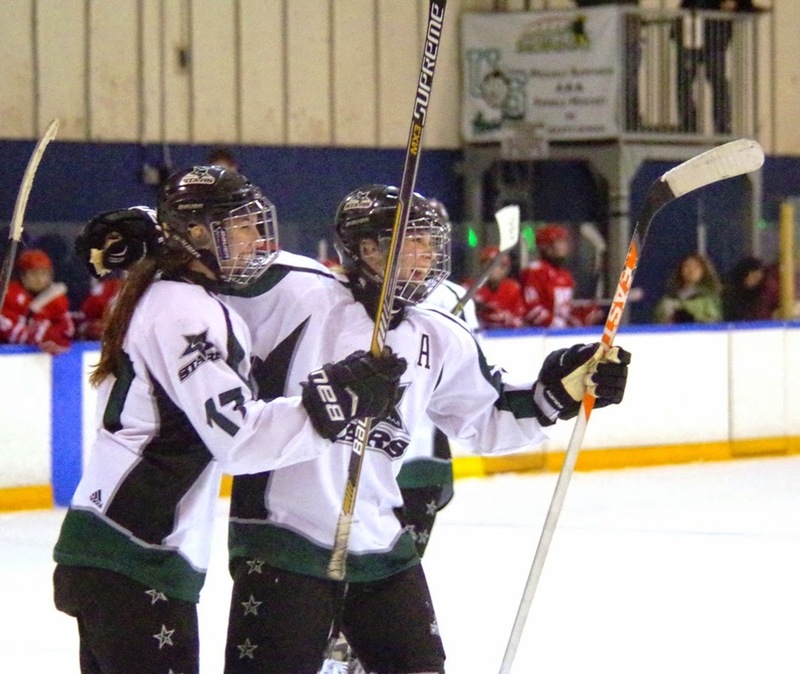 The Stars celebrate a goal in the SFMAAAHL semifinal round. 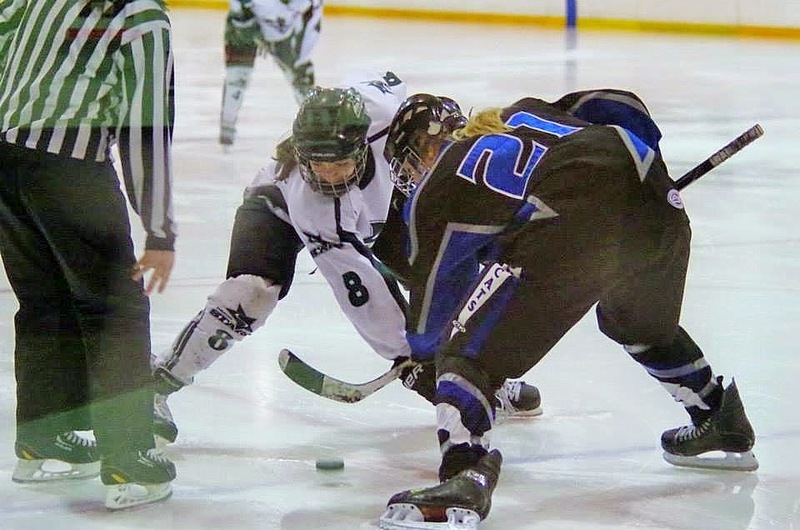 The Saskatoon Stars and Prince Albert A & W Bears appeared destined to face each other for the Saskatchewan Female Midget AAA Hockey League title. During the regular season, they were the two top teams in the league. The Stars finished first with a 25-3 record, while the Bears were second with a 20-6-2 mark. They also split four regular season meetings. They will now battle in a best-of-five series for the Fedoruk Cup to become SFMAAAHL champions. Game 1 is set for 2 p.m. Saturday at the Agriplace Arena in Saskatoon. Game 2 follows at 7 p.m. Sunday at the Art Hauser Centre in Prince Albert. The Stars have had their most memorable season to date in team history. The 2014-2015 campaign marked the first time they ever finished first overall in the regular season standings. They also won their second Mac's tournament title in team history and are currently 37-3 counting regular season, post-season and Mac's tournament action. Saskatoon is making its fourth appearance in the league final having lost in 2010, 2011 and 2012. The Stars are led by a young dynamic duo in Nara Elia and Sophia Shirley, who both have two years of eligibility remaining in midget hockey. Elia topped the SFMAAAHL scoring race with 23 goals and 17 assist. Shirley was second in SFMAAAHL scoring with 22 goals and 17 assists. Elia was injured after being on the receiving end of a head hit in Game 1 of the Stars three game sweep of the Swift Current Diamond Energy Wildcats in the league semifinal round. Odds are good that she will be available at some point for the league championship series. Willow Slobodzian controls the point for the Stars. Rookie Willow Slobodzian was Saskatoon's top scorer on defence recording six goals and 13 assists in the regular season. Paige Michalenko, the Stars 17-year-old captain, had three goals and six assists in 21 regular season games and is strong at controlling play in the defensive zone patrolling the back end. Netminders Karlee Fetch and Emma Johnson split time in goal for the Stars during the regular campaign. Fetch, who is a 17-year-old veteran from Prince Albert, posted and 11-3 record, a 1.79 goals against average, a .916 save percentage and five shutouts. Johnson, who is a 15-year-old Saskatoon product, won all 14 of her starts posting a 1.28 goals against average, a .933 save percentage and three shutouts. The biggest absence from the Saskatoon roster is 17-year-old veteran defender Jenna Nash, who suffered a season ending injury while playing for the Saskatchewan provincial team at the Canada Winter Games in Prince George, B.C., in February. She had two goals and nine assists in 24 games. The Bears last won the league title back in 2009. Loaded with a number of key veterans, they love knock off the Stars to return to the top of the SFMAAAHL heap. Madison Casavant and Tylor Lindsay, who are both 17-year-old forwards topped the Bears in team scoring with 26 points each. Casavant had 14 goals and 12 assists, while Lindsay had 12 goals and 14 assists. 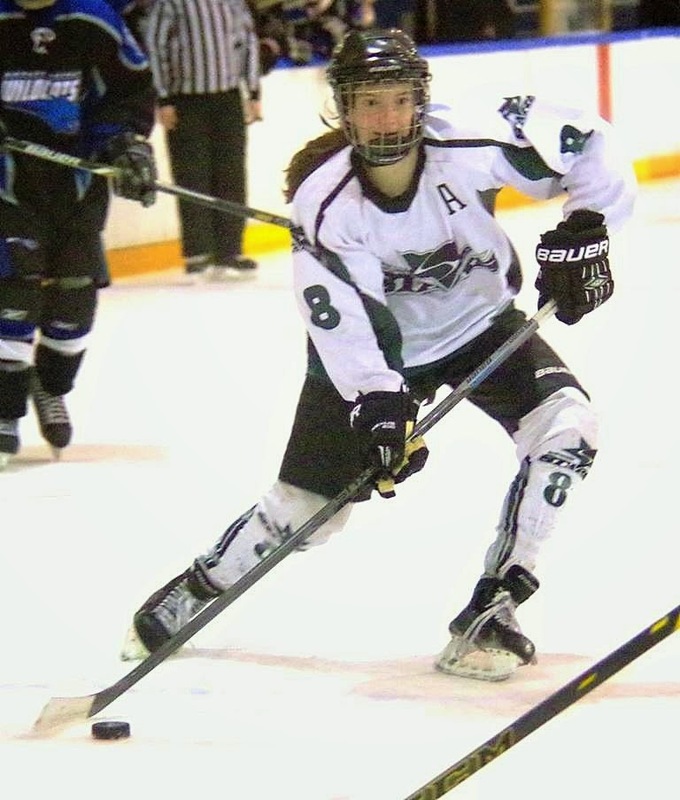 Brooke Hobson, who is a 15-year-old defender, topped all Prince Albert blue-liners in scoring with six goals and 17 assists. Prince Albert's back end received a huge boost when 17-year-old veteran Morgan Willoughby returned from injury. She had two goals and four assists in 15 regular season games and was a steady presence in her own zone. Captain Paige Michalenko anchors the back end for the Stars. In goal, the Bears are backed by 17-year-old standout Jessica Vance, who is the SFMAAAHL's all-time career leader in regular season wins with 48. Vance had an outstanding campaign in her final midget season posting a 13-6 record, a 1.60 goals against average, a .941 save percentage and four shutouts. With how the regular season meetings played out between the Stars and Bears, the provincial championship series between the two teams has a big chance of going the distance. Victory is not a guarantee for either side. A break or two will likely decide the final outcome. Game 3 of the series is slated for Wednesday at 7:15 p.m. at the Agriplace Arena in Saskatoon. If necessary, Game 4 follows on Thursday, March 26, at 7 p.m. at the Art Hauser Centre. If a series deciding Game 5 is required, it will be held on Saturday, March 28 at 3 p.m. at the Agriplace Arena. Blades goaltender Nik Amundrud focuses on the play coming up ice. As the Saskatoon Blades continue to retool and rebuild, the position they likely won't have to tinker with is in goal. When it comes to any level of hockey, the goaltending position always faces the most scrutiny and the most pressure. A team needs to be sold in net, if it has any hope of victory. The Blades appear to have two good ones in Nik Amundrud and Brock Hamm, who are both rookies in their 17-year-old seasons of eligibility. Amundrud joined the Blades shortly after the start of the regular season in trade with the Everett Silvertips, which saw star forward Nikita Scherbak leave the Bridge City. Hamm joined the Blades in January from the Humboldt Broncos of the Saskatchewan junior A ranks after a goaltending spot opened up when Trevor Martin was dealt to the Red Deer Rebels. Out of the two puckstoppers, Amundrud has the bigger sample size of work to grade as he has been with the Blades pretty much for the whole campaign. Over the course of the season, his improvement curve has been very good. Had he been on a club that is just sneaking into the playoffs that has a little bit of a scoring punch, he is at the point that he might be able to create an upset in the first round and turn some heads. As it is, the Melfort product should be given big credit for doing his part to give the Blades a chance to win on most nights. On the season, his 7-22-2 record, 3.94 goals against average and .895 save percentage aren't going to raise too many looks. The fact he has managed to post three shutout victories should. Amundrud turns away a Wheat Kings' scoring chance. Standing 6-foot-1 and weighing 165 pounds, Amundrud has developed a reputation for making acrobatic type saves. Playing on a team that is last in the WHL at 19-47-4, Amundrud has faced all sorts of quality scoring chances on a nightly basis. He has makes numerous tough stops game in and game out to keep the Blades alive in games. Eventually, the volume of good chances he faces does ended up catching up to him, which sees the opposition pot enough goals to skate away with victory. Being a rookie 17-year-old goaltender in the WHL is huge challenge for anyone to face at any point in time. Amundrud's challenge has been that much bigger. With the Blades working hard to rebuild their roster from hosting the 2013 Memorial Cup and from loading up for the 2011 post-season, Amundrud has seen a revolving door of players arrive and leave the team's dressing room. At times, he would see the person he became a best friend with get deal off to another city. Thanks to all these moves, Amundrud has had various players playing out in front of him, who are all at different points in their respective learning curves. On the young squad, he has arguably had the most consistent effort. Under an optimal situation, a rookie 17-year-old or 16-year-old goaltender will enter the WHL and be an apprentice backup to an established veteran who helps show the youngster the ropes. During the second half of the season, Amundrud hasn't had that luxury. He has been paired with another talented youngster in Hamm. In half a season, Hamm has posted a 6-7 record with a 3.61 goals against average and a .904 save percentage. Before joining the Blades, Hamm was able to build up confidence posting a 2.72 goals against average and a .918 save percentage in 21 starts in Humboldt in the Saskatchewan Junior Hockey League, where he had a 9-10 record. Amundrud faced a situation that could have broken his confidence. He wasn't going to have any easy nights. If he struggled, the Blades would have no chance to win. Nik Amundrud gets set in the Blades' goal. The fact his confidence wasn't shattered shows he has good character. On Saturday at the SaskTel Centre, Amundrud was putting up another 33-save gem against the Brandon Wheat Kings, who lead the WHL with a 51-11-4-3 record. The Wheaties are so deep this year that everyone one of their forward lines and defensive pairings is good. Still, the tilt before 6,718 spectators went into the third period locked in a 1-1 tie. Brandon potted two goals in the third to pull out a 3-1 victory. The Blades are making smart player moves, and it is fair to say their roster next season will be better than it was this season. Goaltending is always a tough thing to judge and Hamm may be the guy that ultimately carries the load or two other netminders might be brought in to take out the current incumbents. What Amundrud has done has been impressive. He has given them a chance to win and be in almost every game he has started. With the experience he has gained, you have to believe he will be even better in his sophomore season. As other parts of the team are tinkered with, it is nice to know you have someone to rely on in goal. The Saskatoon Stars celebrate their Game 3 SFMAAAHL semifinal series win. The Saskatoon Stars weren't going to be denied a chance to play for a league title. Facing a determined Swift Current Diamond Energy Wildcats side in front of a packed gathering this afternoon at the Agriplace Arena, the Stars fell behind 1-0, before surging 3-1 thanks to three straight tallies in the second period. The visitors rallied back netting a goal in the third, but that was as close as they would come to a comeback. The Stars held on for a 3-2 victory in Game 3 of a best-of-five Saskatchewan Female Midget AAA Hockey League semifinal series between the two clubs. Saskatoon swept the series 3-0 and advances to a best-of-five league championship series. The Stars will play the winner of the other league semifinal series between the Prince Albert A & W Bears and the Weyburn Southern Range Golden Wings. The series between the Bears and Wings is tied 1-1 heading into tonight's Game 3 in Prince Albert. In the afternoon clash between the Stars and Wildcats, Taylor Kirwan gave the Wildcats a 1-0 lead early in the second period. The Stars rallied back with singles coming from the sticks of Julia Rongve, Brittany Heuchert and Sophia Shirley to head into the second intermission with a 3-1 lead. Brittany Heuchert, the assistant captain, celebrates her goal for the Stars. Shirley, who picked up assists on Rongve's and Heuchert's goals, tipped home a shot from linemate Courtney Cormack on the power play with 6:40 play in the second period, and that tally stood up for the winner. Kirwan added her second of the game with 3:44 to play in the third to pull Swift Current to within 3-2, but the speedy Wildcats couldn't find the equalizer. Karlee Fetch made 25 saves to earn the win in goal for the Stars. Jasey Book turned away 27 shots taking the loss in goal for the Wildcats. With Saturday's victory, the Stars improved their overall record to 37-3 in the 2014-15 campaign including play in the regular season, post-season and Mac's Midget Tournament. If you have any comments about this blog, feel free to email them to stankssports@gmail.com. Check out the Twitter handle @stankssports to see more photos of the Stars Game 3 win over the Wildcats. Nara Elia led the SFMAAAHL in scoring this season. Nara Elia and Sophia Shirley look like they are ready to play hockey in the university ranks right now. However, two full seasons still have to pass before the two top scores from the Saskatchewan Female Midget AAA Hockey League can jump to the post-season ranks. The talented duo are helping lift their hometown Saskatoon Stars to heights the program has never seen. The nation got a first glimpse of them on New Year's Day. 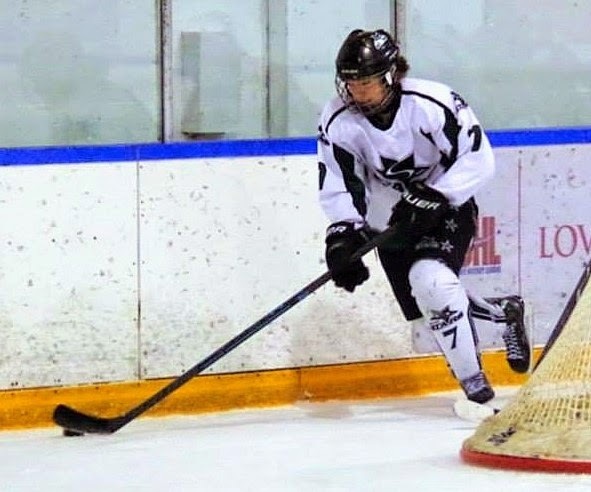 In the nationally televised female final of the prestigious Mac's Midget Tournament, Elia set up Shirley for three goals as the Stars doubled up the Calgary Fire 4-2. The win completed a 6-0 run for the Stars at the Mac's, which they also won back in 2011. 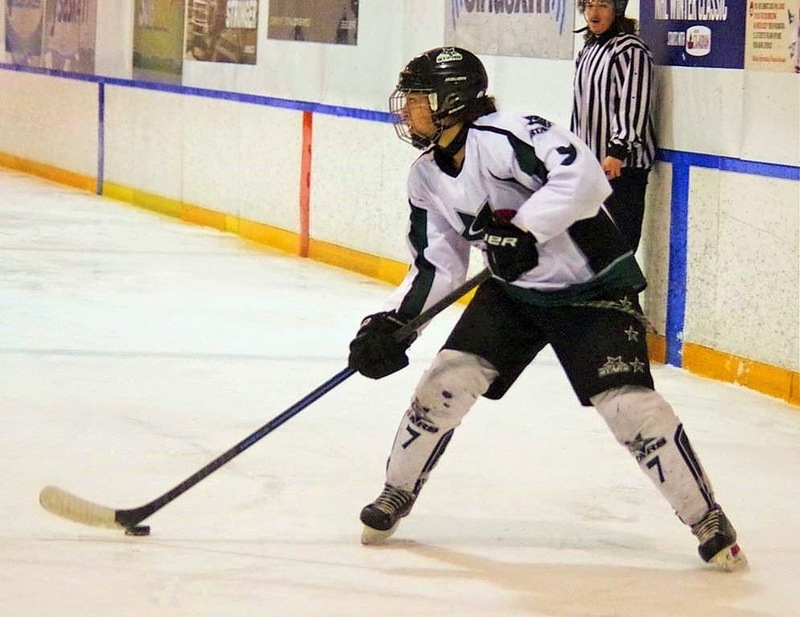 In the SFMAAAHL regular season, Elia won the league scoring title piling up 23 goals and 17 assists. Shirley was a second – a point back – with 22 goals and 17 assists. Those accomplishments are amazing as Elia turned 16 in February and Shirley is still 15. The large majority of players in the midget AAA are older than them, and yet they can make a lot of those veterans look out of place. Sophia Shirley was second in SFMAAAHL scoring. When they hit the ice on the Stars top line, you notice them pretty fast as they make the puck dance in the offensive zone. The chemistry they have to make plays is inspiring. They are seeing a game that no one else on the sheet of ice they are playing on is seeing. They play on a team that is deep in talent. To be fair, placing them on the Stars roster might be the equivalent of giving Superman brass knuckles to take out the bad guys. They make their coaches look like better coaches, because they are that good. As a result of the superhuman efforts of Elia, who stands 5-foot-7, and Shirley, who stands 5-foot-4, the Stars rocketed to first place in the Saskatchewan league with a 25-3 mark. Add in results from the Mac's and the playoffs, the Stars are an incredible 36-3 overall. During semifinal round of the SFMAAAHL playoffs, the Stars dynamic duo has shown they can once again take their game up another level, when the stakes get higher and the competition gets tougher. In Game 1 of a best-of-five series against the Swift Current Diamond Energy Wildcats on Tuesday at the Agriplace Arena, Shirley laser beamed the game's first goal top corner on Wildcats goaltender Jasey Book. Book appeared to have a look of disbelief after that rocket beat her. After the Wildcats tied the game 1-1 early in the second, Elia got the puck to Shirley down low, and she potted a pretty goal on a deke move to put the Stars up 2-1. The duo teamed up to set up linemate Julia Rongve to put the Stars up 3-1. Brittany Heuchert, a veteran 17-year-old forward, potted the Stars final goal in the third period in the 4-2 victory. Nara Elia wheels with the puck for the Stars. The performance of the Stars two superstars was legit solid. The Wildcats were a respectable 15-11-2 in the regular season and are also a fast skating club. They also had to be a confident team, because they dumped the Stars 5-2 in the final regular season contest for both clubs back on Feb. 22 in Swift Current. Elia and Shirley showed they were ready for the challenge. The only downer in Game 1 came from the fact Elia was lost to injury in the third period after being on the receiving end of a head hit from Wildcats forward Chloe Smith, who was given a major penalty and a game misconduct on the play. In Game 2 on Thursday in Swift Current and playing without Elia, the Stars showed their depth pulling out a 3-2 overtime win. Shirley had an assist, but the supporting cast came through. Danielle Nogier and Kianna Dietz scored in regulation, while 17-year-old Courtney Cormack, who recently committed to playing for the University of Saskatchewan Huskies women's team, potted the overtime winner. Sophia Shirley battles for a draw for the Stars. The Stars will try to close out the Wildcats on Saturday in Saskatoon (2 p.m., Agriplace Arena). Elia likely won't be available for that next title, but her absence just makes her team a little bit more human. Shirley and the rest of the Stars have more than enough to finish the job against the Wildcats and earn a berth into the league championship series. Before Saskatoon's post-season run ends, Elia will likely return at some point and will once again be teamed with Shirley. With that combo together again, the Stars might be too much for anyone to handle. As it stands right now, few teams have been able to hang with the Stars as it is. Ben Baker quarterbacks an offensive set for the Huskies. The University of Saskatchewan Huskies men's basketball team were minutes if not seconds away from a dream Saturday night. Playing at the Physical Activity Complex before a crowd of 1,802 spectators, the Huskies were trying to win their first Canada West championship on home court. For a program that has one modern era Canada West title win and one national championship coming in the 2009-10 campaign, Saturday's conference title game against the University of Victoria Vikes presented a unique opportunity. It was obvious from the outset the crowd was energized with hopes of celebrating a title win at game's end. The PAC was alive and rocking way beyond anything that was seen in the regular season, when an average of about 600 people turned out for hoops games. It was a dream those involved with Huskie Athletics had envisioned when the PAC replaced Education Gym as the home of the program's teams in 2003. The PAC was full of a large number of members from all the other Huskies teams, whose respective competitive seasons had come to an end. There was also a big representation for the community at large, who were checking the game out intrigued by the excitement. The raucous gathering witnessed an epic contest, which showed Canadian Interuniversity Sport hoops at its best. Unfortunately, the home side didn't win. The Vikes pulled out a 70-67 victory. When it came time for the banner and trophy presentations, most of the crowd had bolted for the exits. Matthew Forbes battles in the post for the Huskies. By making the Canada West final, both teams earned spots in the CIS men's championship tournament, which starts this coming Thursday and runs through to Sunday at the Mattamy Athletic Centre in Toronto hosted by Ryerson University. In Friday's Canada West semifinal games, the Huskies knocked off the University of British Columbia Thunderbirds 81-75, while Vikes dumped the University of Fraser Valley Cascades 86-61. Even with their spots at nationals all locked away, the Huskies and Vikes played like their seasons were on the line. The Vikes led by 14 points at one point in the second quarter, but the Huskies roared back to hold a 10-point edge at one point in the third quarter in a back-and-fourth contest. Huskies guard Ben Baker, who was the Canada West defensive player of the year, was outstanding in leading the Huskies with 21 points and 10 rebounds. Guard Evan Ostertag came off the bench to provide huge energy for the home side and 17 points. Vikes guard Marcus Tibbs had a huge outing for the Vikes leading all scorers with 25 points, while dishing out seven assists. The Vikes held a 41-32 lead at halftime, but the Huskies rebounded to hold a 60-56 edge after three quarters. The teams were locked in a 65-65 draw with 3:44 to play in the fourth quarter, when the defences came to dominate on both sides. The Vikes outscored the Huskies 5-2 over the final 3:44. The hosts also had a basket taken off the scoreboard due to an offensive charging foul. Tibbs put the Vikes up 67-65 with a jumper. Huskies forward Matthew Forbes hit a pair of three-throws to force a 67-67 tie. With an even score, Tibbs hit a baseline jumper, which resulted in the game-winning points. Vikes forward Chris McLaughlin, who is the Canada West player-of-the-year, hit a foul shot to give the visitors their 70-67 edge. Baker attempted a three in the game's final seconds to try to force overtime, but facing huge defensive pressure, his shot was off target. The U of Victoria Vikes celebrate a Canada West title. Had the Huskies won, they would have been able to soak in the attention from family, friends, classmates and fellow Huskie athletes in the post-game celebrations. The chance for a rare home celebration was gone. They had finished first in the Pioneer Division to earn the chance to host the Canada West Final Four, but those types of regular seasons don't come around that often, even if the team is good. With all that said, the Huskies can make the disappointment of not winning the Canada West title go away, if they can capture a second national title. They enter the eight-team CIS tournament as the lowest seed and open against the Carlton University Ravens, who have won the last four CIS titles and 10 CIS titles in total. The Huskies will be the underdogs going forward. Back in 2009-10, the Huskies were also the underdogs in a national title run that came virtually out of nowhere. They finished that campaign with 13 straight victories to win it all. While winning a national title would make the setback in the Canada West final mostly forgettable, a home court victory party would have been a nice memory to have. Kelsey Trulsrud - a heart and soul Huskie. 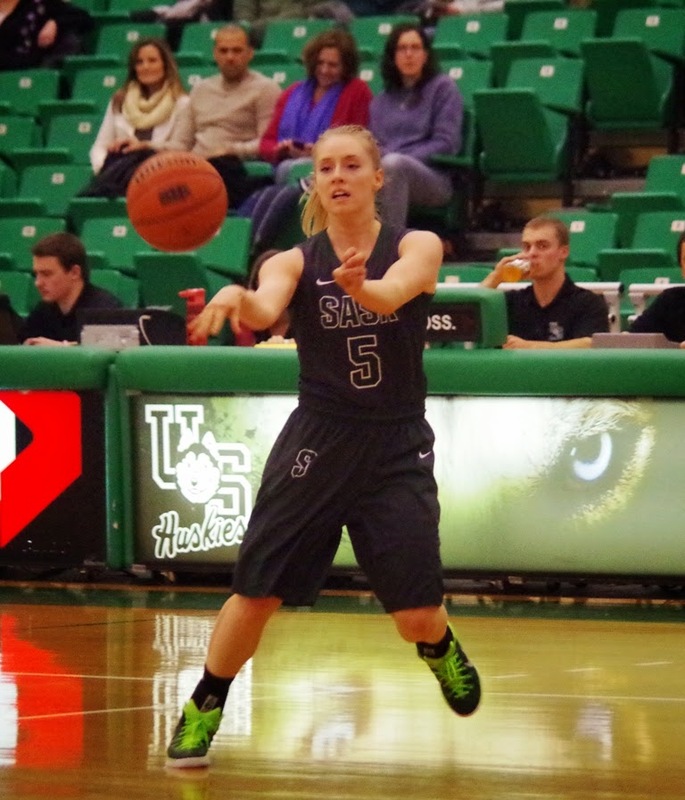 A March Madness type finish proved to be the difference in preventing the U of S Huskies women's basketball team from winning the Canada West title for a second straight season. On Saturday night in Vancouver, the Huskies led the host UBC Thunderbirds 68-67 with about 15 seconds to play. Huskies guard Kelsey Trulsrud was at the free-throw line for a pair of shots trying to extend the lead for the visitors. Trulsrud missed both attempts. Thunderbirds guard Kris Young hauled in the rebound from the second miss, went coast-to-coast and hit a runner off the glass with 7.8 seconds to play to give the Thunderbirds a 69-68 victory. The Huskies couldn't get a shot off with their final possession. Young, who was the Canada West player-of-the-year, topped the Thunderbirds with 21 points, while forward Harleen Sidhu added 18 points to aid the winning effort by the hosts. Laura Dally had a huge night for the Huskies leading the team with 21 points, which included making 4-of-8 shots from three-point land. Trulsrud, who is one of those heart-and-soul players you need in the dressing room, had a strong outing too recording 15 points, 12 rebounds and four assists. One of the Huskies most unsung players, it was more unfortunate than anything that she wasn't able to make the two foul shots in the final seconds of the fourth quarter. 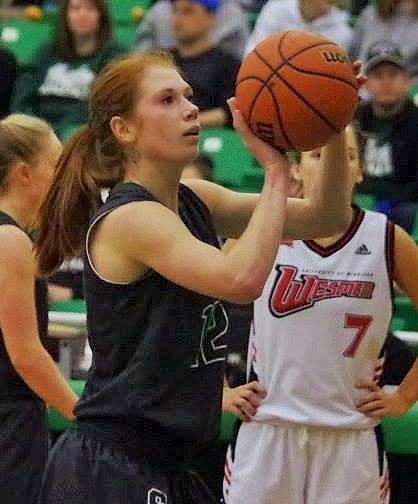 The Huskies entered the Canada West final riding a 16-game winning streak and had downed the University of Alberta Pandas 77-61 in a Canada West semifinal match on Friday. Both the Huskies and Thunderbirds earned spots to the eight-team CIS women's championship tournament that begins Thursday in Quebec City at the Universite Laval. 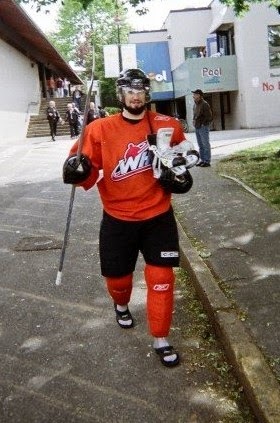 David Schlemko at the 2007 Memorial Cup. It only took one NHL game for Calgary Flames supporters to know who David Schlemko was. In his debut with the Flames, the veteran 27-year-old defenceman scored a spectacular winning goal in a tiebreaking shootout to give Calgary a 4-3 road victory over the Bruins in Boston last Thursday. The tally was replayed on numerous sports highlight shows. The Edmonton product is also in the final year of his current contract and has been bounced around this season. He started the season with the Arizona Coyotes. Entering the current campaign, Schlemko had played his entire professional career with the Coyotes organization. After recording a goal, three assists and a minus-five rating in 20 regular season games this season with the Coyotes, Schlemko was put on waivers and claimed by the Dallas Stars. He played five games with the Stars before being placed on waivers again, where he was claimed by the Flames. Going back to his major junior days with the Medicine Hat Tigers, Schlemko developed a reputation as being an even-keel player with a nice offensive touch and someone who is just an all-around good guy. He also became well known as a shootout specialist, who score goals in the tiebreaking session with an arsenal of moves. In the NHL ranks, Schlemko has only received two opportunities in the shootout, and he scored on both of them. Before joining the Flames, Schlemko had appeared in 212 NHL regular season games dating back to the 2007-08 campaign. As NHL teams have a tendency to constantly bring in young prospects, it looked like with two waiver placements that Schlemko might get forced out of the league. That happens to a number of players in his situation, even though he could hardly be considered old for a professional hockey player. If he is given a fair opportunity and allowed to use his strengths, Flames supporters will likely see their team received a gift in being able to pick up Schlemko. When the Flames campaign does end, the likelihood is very high Schlemko will do enough that Flames management will be convinced to sign him to a new deal. Matthew Forbes slams down a huge basket for the Huskies. 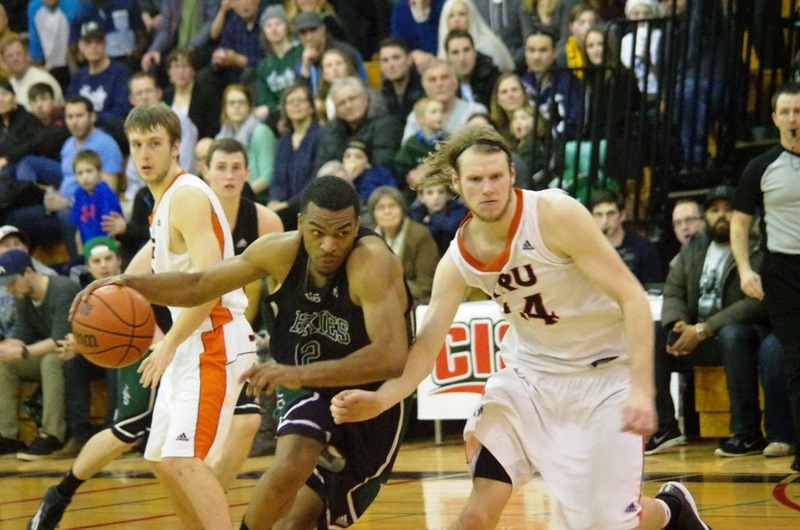 One elimination game down, and the University of Saskatchewan Huskies men's basketball team hopes to experience a lot more do-or-die matches in March. The Huskies didn't take the easy road in claiming a best-of-three Canada West quarter-final playoff series 2-1 against the Thompson Rivers University Wolfpack. In all three games, U of S fell behind by sizable margins, but managed two successful comebacks to stay alive in the post-season. In a series deciding Game 3 on Sunday at the Physical Activity Complex, the Wolfpack led the host Huskies 39-29 at one point in the second quarter. The visitor's led was cut to 43-42 at halftime after Huskies guard Evan Ostertag hit a three at the buzzer. The hosts took a 61-57 lead after the third quarter and rolled in the fourth quarter to an 84-71 victory. The win was capped by a monster dunk by Huskies post Matthew Forbes inside of the contest's final minute. Thanks to that win, the Huskies will have the rare privilege of host the men's Canada West Final Four tournament this coming Friday and Saturday at the Physical Activity Complex. The opening match at 6 p.m. on Friday sees the U of Victoria Vikes, who were 15-5 in the regular season, take on the Abbotsford, B.C., based University of the Fraser Valley Cascades, who were 17-3 in the regular season. At 8 p.m., the U of British Columbia Thunderbirds, who were 14-6 in the regular season, face the Huskies, who were 15-5 in the regular season. The Huskies host the final four, because they topped the Conference's Pioneer Division. The Cascades topped the Explorer Division. Before the Huskies could think about hosting the final four, they had to down a determined Wolfpack side. 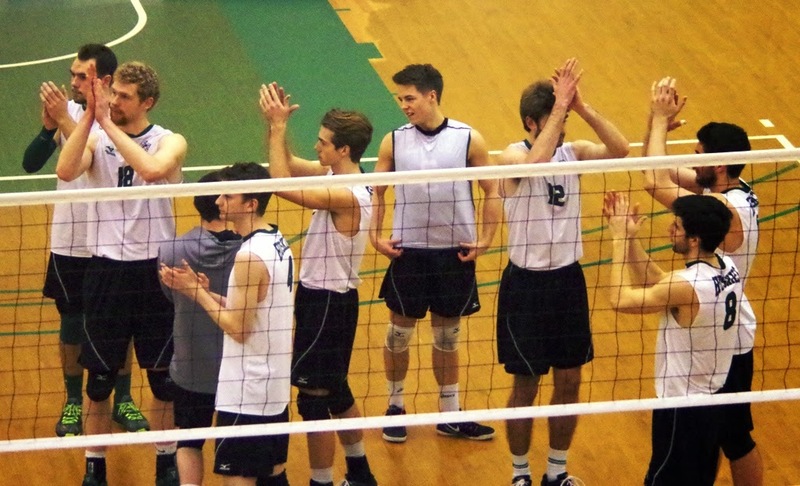 Games 1 and 2 were held at St. Joseph High School due to the fact the U of Saskatchewan was hosting the Canadian Interuniversity Sport Men's Volleyball Championship tournament. The atmosphere at the packed high school gym was raucous on both nights. In Game 1 last Friday, the Wolfpack, who were 11-9 in the regular season, jumped out to a 27-19 lead after the first quarter and held a 49-43 edge at halftime. The Huskies dominated the second half and rolled to a 96-82 victory. Veteran post Matthew Forbes led the way for the Huskies with 20 points, while second-year forward Shane Osayande came off the bench and hit all seven of his shot attempts to finish second in team scoring with 14 points. Dadrian Collins drives the lane for the Huskies at St. Joseph High School. 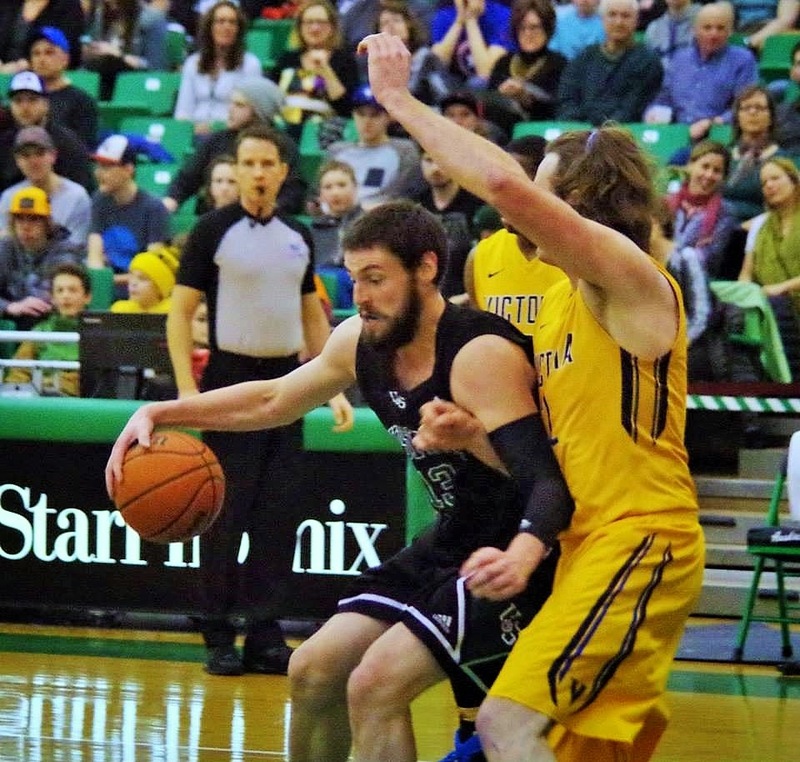 In Game 2 last Saturday, the Huskies faithful packed the gym at St. Joseph High School hoping the first half scare the Kamloops, B.C., based Wolfpack gave the U of S side would only happen for one game. It didn't. The Wolfpack stormed out to a 16-0 lead and held a 40-25 edge at halftime. The Huskies rallied in the second half and closed to within 71-69 late in the game. The visitors scored to go up 73-69 and closed out an 81-75 victory to tie the series 1-1. Andrew Henry and Dadrian Collins led the Huskies with 12 points each in the Game 2 setback. Game 3 back at the PAC wasn't an easy one for the Huskies to pull out. Wolfpack fifth-year guard Brett Rouault went off for a game-high 33 points mostly due to hitting 7-of-10 shots from three-point range. Forbes countered topping the Huskies with 30 points to help the hosts get their series clinching 84-71 win. Going forward in the post-season, the Huskies would like to have some better starts, but they should have some confidence knowing the can pull out big comeback victories if they need to. Now, they face was is essentially another elimination game. 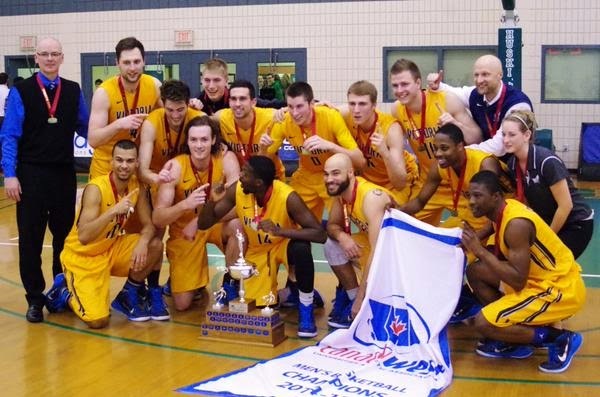 The two teams that make the final of the Canada West Final Four advance to the Canadian Interuniversity Sport Final Eight championship tournament hosted by Ryerson University in Toronto. 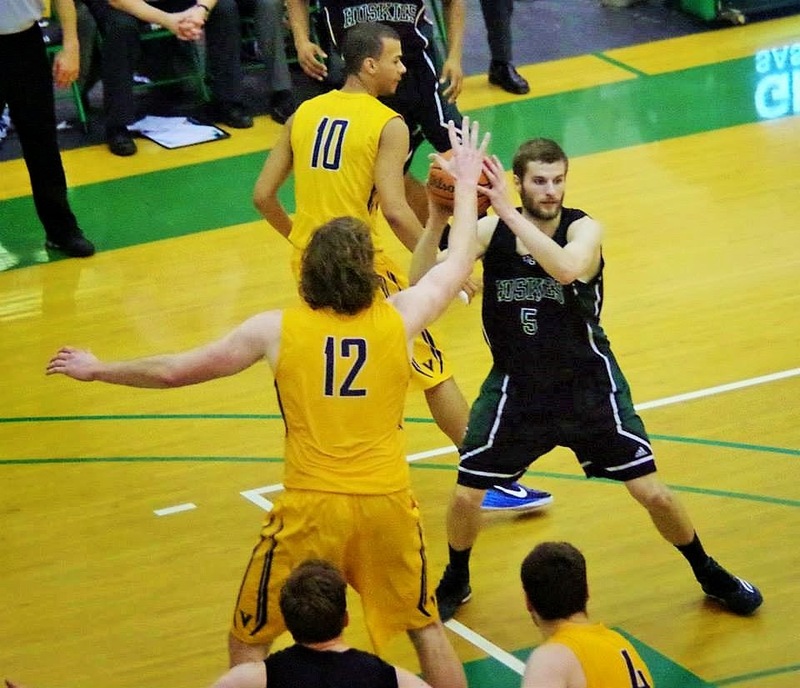 The winners of the semifinal games of the Canada West Final Four this coming Friday will ensure they will play in the final weekend of the 2014-15 campaign. Being at home for basically a do-or-die match, you have to like the Huskies chances of advancing, even if they do fall behind once again. Kabree Howard dishes the ball for the Huskies. The Huskies women's basketball team will be on the road for the duration of their playoff run. They had a chance of hosting the women's Canada West Final Four tournament had the U of Regina Cougars upset the UBC Thunderbirds in a best-of-three quarter-final series in Vancouver. The favoured Thunderbirds prevailed. UBC took Game 1 on Friday 75-59 and Game 2 on Saturday 68-63. As a result, the women's Canada West Final Four opens on Friday in Vancouver. The Huskies, who were 17-3 in the regular season, face the U of Victoria Vikes, who were 13-7 in the regular season. The Thunderbirds, who were 17-3 in the regular season, take on the U of Alberta Pandas, who were 16-4 in the regular season, in the other semifinal. The Huskies enter the final four having won 15 straight games combined in the regular season and playoffs. The Huskies salute their home crowd after their last regular season game. Huskie Athletics should get all sorts of high praise for host an outstanding Canadian Interuniversity Sport Men's Volleyball Championship tournament. There had to be a bit of fear with regards to how well attended the event would be at the Physical Activity Complex if the host Huskies weren't able to advance to the semifinal round. The Huskies did not qualify for the Canada West playoffs finishing the regular season with a 12-12 record and were seeded eighth in the eight-team event. They played hard in the quarter-final round but committed too many errors in being swept away by the top seeded McMaster University Marauders by scores of 26-24, 25-20 and 25-18. Officially attendance was 2,223 at the PAC, which seats 2,500. Those that were there said it was hard to find a seat, and spectators filled the standing space that rung round the track at the top of the stands. With the Huskies knocked to the consolation side, attendance stayed fairly strong. A total of 1,841 spectators attended Friday's semifinal round and 2,127 were out for the medal round games on Saturday. Those numbers have to be considered huge successes. Overall, this year's CIS Men's Volleyball Championship tournament was viewed as being extremely well run. In the title game, U of Alberta Golden Bears repeated as champs sweeping the Trinity Western University Spartans 25-19, 25-17 and 25-15. McMaster swept Dalhousie University 3-0 in the bronze medal game. The host Huskies downed Universite de Laval 3-1 in a consolation semifinal match and took the consolation final 3-1 over York University to finish fifth. Once again, Canada West showed it is the powerhouse conference in men's volleyball, as its three entries finished in the top five of the CIS tournament. That powerhouse showing takes a whole new light considering the Huskies just missed making the Canada West Conference playoffs and were still fifth at nationals. Canada West Conference teams have claimed 20 of the last 21 championships in CIS men's volleyball. Courtney Cormack, left, and Danielle Nogier celebrate a goal. The Saskatoon Stars will enjoy a little bit of time off before they resume their quest to earn a provincial title. On Sunday, the Stars completed a 3-0 sweep of their best-of-five Saskatchewan Female Midget AAA Hockey League quarter-final series over the Notre Dame Hounds. Saskatoon took Game 1 in Wilcox 7-2 on Thursday, and Games 2 and 3 at the Agriplace Arena by respective scores of 9-5 and 10-0 on Saturday and Sunday. Those results weren't much of a surprise as the Stars finished first in the league at 25-3, while the Hounds were last in the eight-team circuit at 4-22-2. The Stars top forwards Nara Elia and Sophia Shirley each had six goals and six assists in the series. Their linemate Julia Rongve had three goals and six assists. Forward Courtney Cormack have five goals and an assist in the three games. Saskatoon's opponent for the semifinal round is still to be determined as two quarter-final series were still ongoing after Sunday. The post-season road will definitely become more challenging from here on out for the Stars, who won the female title in the Mac's Midget AAA Tournament on Jan. 1. As they progress through the playoffs, they will pick up more and more attention in the Saskatoon area as a number of other local teams see their campaigns come to an end. At the moment, the Stars are still one of the best kept secrets in the Bridge City. By the end of March, they will likely have an increased profile.